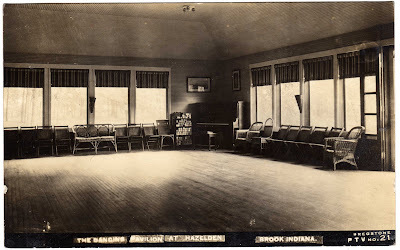 Today's entry rambles headlong into the worlds of dance halls, American authors, turn-of-the-century outdoor recreation, fables and baseball. It all starts with the intriguing black-and-white image above (which reveals even more of its fine detail if you click on it for a larger version). The back of the card is blank except for the printed phrases "POST CARD", "CORRESPONDENCE" and "ADDRESS ONLY". I think this postcard dates from the 1910s or early 1920s. And I think -- and there's a chance I'm wrong here -- that the pictured pavilion is on the estate of author George Ade (1866-1944). Ade's estate was built in 1903 in Brook, Indiana, and was referred to as Hazelden Farm or just Hazelden. "We need in the country more playgrounds and more shower baths and recognition of the truth that the men and women who live in the country need not regard themselves as mere work animals. We need these things if we are to check the flow of the population to the cities," writes George Ade to the national headquarters of Community Service (Incorporated). Out on Hazelden Farm in Indiana Mr. Ade (pictured at right) is putting this belief in practice. Here is his description of the way his private woods and fields and swimming pool and golf course have become a recreation center for the people of the country round about. "In 1904 I moved to the country, in order to find a quiet spot where I could do my work undisturbed by the complications of city life. My house was built at one corner of a farm which I own and because this corner of the farm bordered a small river and was wooded with very fine specimens of our best native trees, I became generous and gave myself a wide domain for the private grounds surrounding the house. ... People came in large numbers to ramble about the premises and hold picnic parties. We had about the only playground in the whole region which was cleared away and had an artificial setting of flowers and green sward. "In 1908 Mr. Taft opened his presidential campaign here at Hazelden, and we had 15,000 to 20,000 people on the grounds that day. "I built a swimming pool out at the west of the grounds and later on built a dancing pavilion, fifty by thirty-five feet, and that building has been used for a hundred purposes since 1910. The State Council of Defense met there and also the County Council. The Red Cross used it during the war as an assembling depot. Clubs and societies from Chicago and Indianapolis and other cities have made it their headquarters at various outings. Near the pavilion, as we call it, was a fine open playground entirely circled by trees. Here we laid out a small diamond and the business men from surrounding towns came once a week to play soft ball. Later on we laid out a little nine-hole golf course within the home grounds. The neighbors became so fond of the baby course that a club was formed and now we have a real nine-hole course, three thousand yards long, and we have a club-house and a good tennis court and nearly all the usual fixtures of an up-to-date country club.2"
My first thought after reading that passage: Why would someone who wanted a "quiet spot" in the country to get away "the complications of city life", create a recreational estate that regularly drew tens of thousands of visitors and partiers? It's possible that my great-grandparents visited the dancing pavilion at Hazelden. They lived for awhile in Hammond3, a couple hours north of Brook (by the driving standards of that time). My mom explains: "Grandma and Grandpop had good friends, a couple they socialized with out there. ... The four of them might have made a late night of it going dancing occasionally. It was THE thing to do in those days. Nice dance halls with big bands in park pavilions and at clubs were popular right up thru the 1950s." So maybe they rubbed shoulders with Ade at some point. 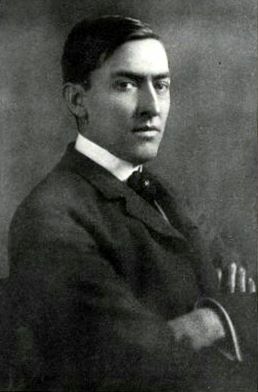 "Ade's literary reputation rests upon his achievements as a great humorist of American character during an important era in American history: the first large wave of migration from the countryside to burgeoning cities like Chicago, where, in fact, Ade produced his best fiction. ... His work constitutes a vast comedy of Midwestern manners and, indeed, a comedy of late 19th century American manners. Ade followed in the footsteps of his idol Mark Twain by making expert use of the American language. 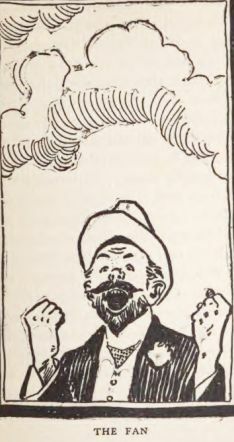 In his unique 'Fables in Slang,' which purveyed not so much slang as the American colloquial vernacular, Ade pursued an effectively genial satire notable for its scrupulous objectivity." His 1899 book "Fables in Slang" is available as a free download from Project Gutenberg. Or, if you want a physical copy, there are plenty of cheap editions available on Amazon.com. Once upon a Time a Base Ball Fan lay on his Death-Bed. He had been a Rooter from the days of Underhand Pitching. It was simply Pie for him to tell in what year Anse began to play with the Rockfords and what Kelly's Batting Average was the Year he sold for Ten Thousand. If you asked him who played Center for Boston in 1886 he could tell you quick—right off the Reel. And he was a walking Directory of all the Glass Arms in the Universe. More than once he had let drive with a Pop Bottle at the Umpire and then yelled "Robber" until his Pipes gave out. For many Summers he would come Home, one Evening after Another, with his Collar melted, and tell his Wife that the Giants made the Colts look like a lot of Colonial Dames playing Bean Bag in a Weedy Lot back of an Orphan Asylum, and they ought to put a Trained Nurse on Third, and the Dummy at Right needed an Automobile, and the New Man couldn't jump out of a Boat and hit the Water, and the Short-Stop wouldn't be able to pick up a Ball if it was handed to him on a Platter with Water Cress around it, and the Easy One to Third that ought to have been Sponge Cake was fielded like a One-Legged Man with St. Vitus dance trying to do the Nashville Salute. Of course she never knew what he was Talking about, but she put up with it, Year after Year, mixing Throat Gargle for him and reading the Games to him when he was having his Eyes tested and had to wear a Green Shade. At last he came to his Ninth Inning and there were Two Strikes called and no Balls, and his Friends knew it was All Day with him. They stood around and tried to forget that he was a Fan. His Wife wept softly and consoled herself with the Thought that possibly he would have amounted to Something if there had been no National Game. She forgave Everything and pleaded for one Final Message. His Lips moved. She leaned over and Listened. He wanted to know if there was Anything in the Morning Papers about the Condition of Bill Lange's Knee. 1. Bregstone refers to St. Louis postcard photographer H.H. Bregstone. In a situation we've also seen with Koester Bakery, Bregstone is remembered more for its baseball cards than anything else. 2. This might have become what is now Hazelden Country Club. 3. Previous posts featuring Hammond include "The more F's the better, plus a little mystery" and "An old copy of The Herbalist Almanac." 4. Being a diehard baseball fan, this is one of the few fables by Ade that made sense to me. The basic characteristics of a baseball fanatic haven't changed much in 100 years. Most of Ade's other fables, though, are difficult for the modern reader to understand, as they are so steeped in the specific culture and references of that era.